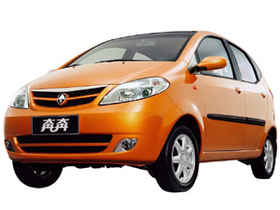 The Changan Benben ranked as China's top compact car in a J.D. Power quality study. SHANGHAI -- When it comes to vehicle quality, domestic Chinese brands are catching up to their global peers, according to the 2010 China Initial Quality Study published by J.D. Power and Associates. The consultancy found that the quality gap between domestic and foreign brands has reached its narrowest margin in the survey's 11-year history. In 2010, domestic Chinese brands averaged 224 problems per 100 vehicles, down sharply from 258 problems a year earlier. By comparison, foreign brands averaged 135 problems, down from 142 problems in 2009. The study is based on evaluations by 14,649 owners of new vehicles purchased between October 2009 and June 2010. U.S.-based J.D. Power canvassed buyers of 151 different models in 33 major cities. The study asked owners to list any problems with new cars after two to six months of ownership. The initial quality score is calculated by the number of problems experienced per 100 vehicles. Over the past 10 years, Chinese brands have enjoyed dramatic improvement. This year's gap with foreign brands -- 89 problems per 100 vehicles -- is a huge improvement over 2000, when the domestic brands had 396 more problems per 100 vehicles.